Carnations is an original crochet pattern by June Gilbank. 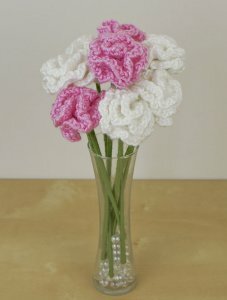 Beautiful, realistic, and so easy, you can crochet a pretty one-piece carnation in minutes – and I bet you won't be able to stop at one! Additional info: You'll also need a bamboo skewer, pipe cleaner, or floral wire to make the optional stems. Option: This pattern will work with any size yarn, provided you choose a suitable hook size for your yarn. For a lifesize carnation, I recommend worsted or DK weight yarn. Date Added: 10/10/2018 by Jessica W.
Date Added: 02/27/2018 by Dee W.